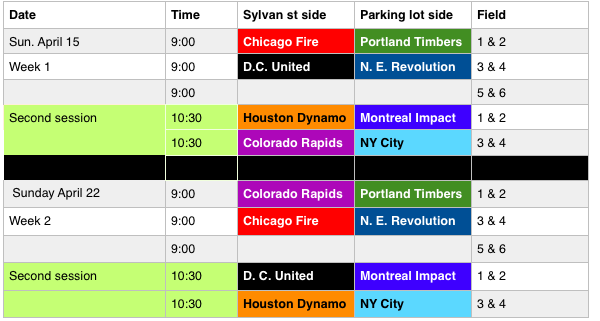 Remember we are using Week 2 Schedule today! 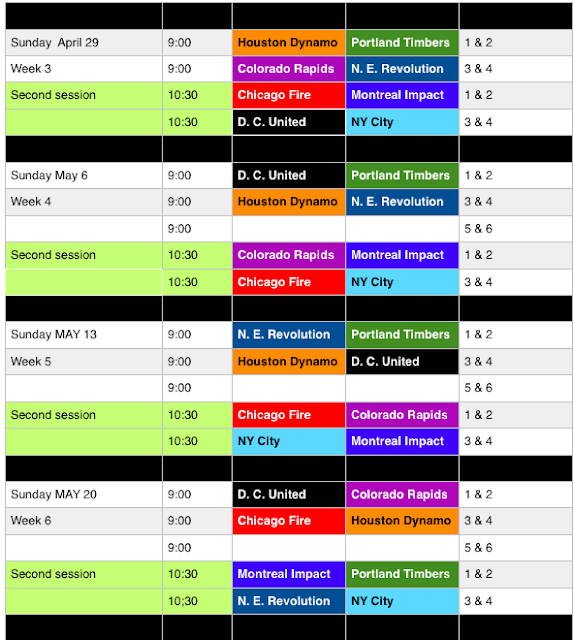 Today Sunday April 22, we are using the week 2 schedule. Thanks! Chuck our VP just got back from Pine Banks and the current condition is very cold and windy with extreme chance of rain coming. If the kids were older we may have tried to play as long we could but we are going to cancel for today. 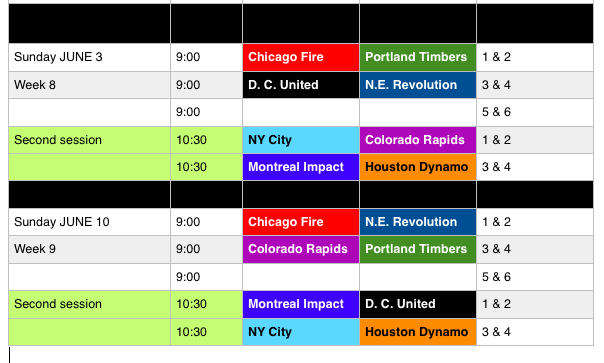 Next week we will follow Week 2 schedule. You have been sent your schedule already, please let me know if you have any questions. Because of field conditions, due to weather, the first game is scheduled for Sunday, April 15th. The season will run thru June 10th. 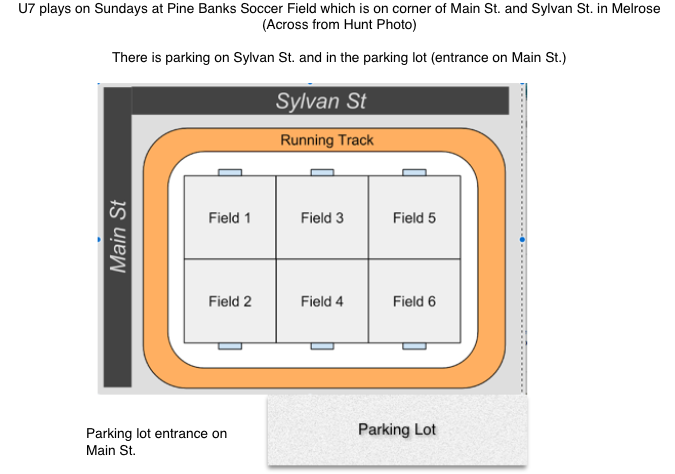 We play at Pine Banks inside track field. Pine Banks is in Melrose on the corner of Main St. and Sylvan St. If you are interested in helping with coaching, please let me know. We will have a 10 game season this Spring. All U7 games will be on Sunday mornings. The times your team plays will change. The last game will be June 11, weather permitting. This Blog will be the primary source of information for schedules, cancellations, etc. Cancellations due to weather will be posted to the blog... please check it within an hour of the start time on game-day morning. If you do not have access to the internet on Sunday mornings, please let me know. Shin pads are required. Your child may be excluded from the game if this important piece of safety equipment is not used. At the U7 level we continue focusing on basic skills, and begin incorporating more of the basic rules into the experience. Our primary focus remains providing a fun and healthy environment for the kids to discover their emerging soccer skills. We do not focus on winning. We don't keep official score, celebrate wins, or mourn losses. We strive for every player to get equal playing time, and try to keep the number of players on the field small in order to maximize opportunities to play. We reward skillful play, good attitudes and sportsmanship. Players must play within their designated age group. Players must play on the team they have been assigned to. Requests for specific teams will be honored if availability permits. Requests made close to the start of the season are often hard or impossible to accomodate. At least one adult supervisor must stay during the entire session and is responsible for watching kids if they wander away from play. Parent involvement is appreciated and encouraged when appropriate but please try not to interfere with the session. Players must not wear jewelry such as earrings, watches, necklaces, etc.